The application is open until April 27, 2018. A substantial part of the current research on QCD in collider physics focuses on the following closely interconnected topics: the formal calculation of amplitudes and integrals, their use in higher-order calculations and the merging of these fixed-order calculations to all order results, either analytic resummations or parton-shower simulations. 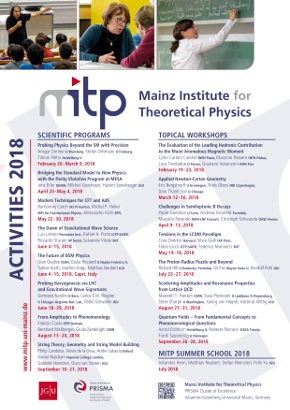 This scientific program is aimed at bringing together the world leading experts on these topics and at addressing several key issues paramount to the future development of high-precision collider phenomenology such as (i) the bridge between the formal computation of amplitudes or formal next-to-next-to leading (NNLO) subtraction schemes to practical realizations and actual phenomenology. In particular issues like advantages / performances / differences / shortcomings of the different subtraction and slicing methods for double real radiation will be addressed. (ii) Recent advances in the computation of virtual corrections: Analytic versus numerical computation and their respective advantages, performance and shortcomings. (iii) Merging fixed order calculations to parton showers, building NNLO parton showers (NNLOPS) and a comparison between different current NNLOPS approaches. (iv) Improvements on shower algorithms.